Contracting with CSI for IT service and support means you can free up time and resources for your own business priorities instead of being distracted by IT issues. At CSI, we offer a full portfolio of service and support options, including 3 levels of cost-saving service bundles as well as a broad menu of Ala Carte services to choose from. Regardless of which support services you purchase from CSI, you can expect your costs and downtime to decrease and your staff productivity to increase. In fact, a recent CompTIA study showed that companies who used Managed Service Providers--like CSI--reduced their annual IT expenditures an average 25%. Some showed a whopping 50% decrease! How? Through proactive monitoring and maintenance of client systems that catches problems before they become huge issues involving expensive downtime and lost sales. The result of this assessment process is a service bundle that exactly fits your needs and your budget. For the small company or small health care office that needs just the basics of IT support, the Essentials Service Bundle delivers the IT services you need most at a price you can afford. 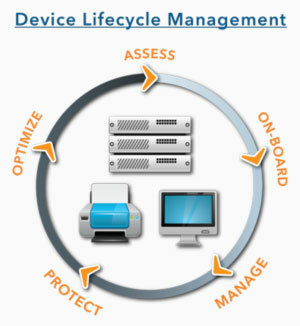 The Essentials Package includes Anti-Virus Protection, Patch Management and remote monitoring of your IT equipment. Repair Work and Help Desk Support are billed at our low hourly rates. See our Essentials Service Page for more details on this program or call us today at 712-255-1775 to discuss your organization’s specific IT needs and get a competitive custom quote. The next step up from basic IT support is CSI’s Proactive Services Bundle. If you have a server and a network, Proactive Services is the minimum level of support your organization needs. Our Proactive package does not include the unlimited Repair hours or 24/7 help desk that our Fully Managed Program does, but Repair Work and Help Desk support are billed at our lowest hourly rates. See our Proactive Services Page for more details on this program or call us today at 712-255-1775 to discuss your organization’s specific needs and determine whether the Proactive Program is the right fit for you. A fully outsourced solution, the Fully Managed package is designed to deliver all of the critical on-going IT services an organization needs at a fixed monthly cost. It includes unlimited Repair and Help Desk hours so you always know what your IT costs will be every month. The only exemptions are Capital Expense projects, Consulting Projects or Project Management (See our Hourly Rates Section for details). Our Fully Managed Services Solution provides our customers with the lowest on-going cost of IT ownership. Side-by-side comparisons show it costs much less maintaining an internal IT staff. Plus, it includes an enhanced reporting package that allows us to spot issues, remediate gaps and help you plan for IT that supports your growth. If you’ve had a Service Level Agreement in the past, this is your package, now with enhanced services and reporting/planning capabilities! See our Fully Managed Services Page for more information on this program, or call CSI at 712-255-1775 to get a customized quote built specifically for your organization’s needs. Want to see a comparison of CSI’s 3 Service Bundles Side by Side? Click here. Ala Carte Services: Like the freedom to choose? The Ala Carte services menu allows you to pick and choose from a wide variety of IT services to create your own bundle at a lower price than buying those services separately. See our Ala Carte Services page for a list of services available at fixed costs and create your own bundle! Then call us at 712-255-1775 for a quote on your unique package of IT service and support. These project based services will be billed at our low hourly rates, but are not available on a fixed fee monthly basis. If you've got an IT, Cabling or Capital Expense project coming up, please contact us at 712-255-1775 for a free consultation and a quote.